I extend to you and, through you, to the people and Government of Zambia the sincere best wishes of the American people and Government. We rejoice that Zambia has become free and now joins the other independent states of Africa in seeking a better life for its people. During the past ten years the United States has warmly and sincerely welcomed many African states into the community of nations. As we welcome Zambia to this community and extend our congratulations to the people of Zambia, we wish to express our personal admiration to you, Mr. President, for the vital role you played during the recent years of preparation for this joyous occasion. We especially admire your success in achieving mutual cooperation and understanding among the different racial elements in Zambia. We sincerely hope that this achievement will be taken as a lesson and example by the entire world. Our interest in your example is greatly heightened by our own efforts to eliminate racial discrimination in the United States. The American nation seeks constantly to foster the development of free nations cooperating for their mutual benefit. We encourage the building of world and regional institutions for joint action and cooperation. We seek the elimination of violence and aggression of any sort in relations among nations, and we support the economic and social development of each nation in the interest of the development of all nations. We believe that this community of free nations can fully achieve the universal goals expressed in the United Nations Charter only when all governments are based on the consent of the governed. We know that Zambia shares these objectives with us. We look forward to close cooperation with you and your Government in pursuing these mutual objectives in the councils of the world and in our relations with each other. Zambia’s independence will permit us to strengthen the ties of friendship and coo operation which have been built up between Zambians and Americans over many years. With every possible good wish for the future success and well-being of Zambia and its people, I extend personally to you and to your Government my warmest congratulations for all that you have accomplished thus far. I pledge my friendship and that of my people and country in the years ahead. [His Excellency Kenneth D. Kaunda, President of the Republic of Zambia, Lusaka] Note: The message was delivered to President Kaunda, whose country became independent on October 24, by Charles W. Engelhard, Personal Representative of the President with the rank of Special Ambassador. President Levy Mwanawasa of Zambia urged southern Africa to take a new approach to Zimbabwe, which he compared to a ”sinking Titanic.” In one of the strongest African comments on the rule of the Zimbabwean president, Robert G. Mugabe. Mr. Mwanawasa said the ”quiet diplomacy” policy of southern African leaders had ”failed to help solve the political chaos and economic meltdown in Zimbabwe.” The ”twist of events in the troubled country,” he said, ”necessitates the adoption of a new approach.” He added that the region’s foreign ministers would discuss the crisis later this week, before a meeting of regional leaders in Tanzania next week. Charles de Gaulle was a leader of the French revolution before becoming president and once said, “…I have come to the conclusion that politics are too serious a matter to be left to the politicians alone” … he also once said, patriotism is when love of your own people comes first; nationalism, when hate for people other than your own comes first.” I totally agree with Chalie and because politics affects us all, we all seem to be political junkies of some sort. Around here we will bestow respect to the democratic enterprise by being as critical but as rational. We understand that there differing political opinions every where every day but above all we all remain Zambian and patriotic at heart. In fact, the main driving force towards constant web surfing for most nationals abroad is predicated upon their desire to know that Zambia is doing just fine. All objective political punditry of logical rationale is encouraged, diverse political philosophies will be espoused because after all is said and done, Zambia remains greater than any single one of us … thanks a trillion. THE current economic path Zambia is taking will improve if the Fifth National Development Plan (FNDP) and the Vision 2030 are implemented according to initial plans, Finance and National Planning Minister, Ng’andu Magande, has said. The poverty levels would drastically go down if all stakeholders helped in the implementation process. Speaking when President Mwanawasa launched the FNDP and the Vision 2030 in Lusaka yesterday, Mr Magande said vast consultations were made while diverse views were incorporated before coming up with the final documents. He said over 800 people from different backgrounds also attended the stakeholders meeting in Lusaka that was organised to look at the draft document of the FNDP. Since contributions to the FNDP and the Vision 2030 came from across Zambia, he expected the dissemination process for the final documents to take the same route. The FNDP and the Vision 2030 were also submitted and approved by Cabinet. Various stakeholders and interest groups attended the launch of the two documents with most of them commending the Government for setting a candid development road map on a long-term basis. Secretary to the Treasury, Situmbeko Musokotwane, said the completion of the two documents could have taken longer than expected because of the necessary consultation that could not be ignored. He thanked civil servants and various interest groups that participated in the formulation exercise of the programme. And Mr Mwanawasa has established an economic planning division in the ministry of Finance and National Planning and immediately appointed Mr James Mulungushi as Permanent Secretary. The division to be called the Planning and Economic Management Division would be responsible for the implementation of the Vision 2030 and Fifth National Development Plan (FNDP) among other development programmes. The President said since the MMD came into power in 1991, it did away with national planning and consequently abolished the National Commission for Development Planning leaving everything to market forces. The establishment of the Planning and Economic Management Division was announced during the launch of the FNDP and the Vision 2030 in Lusaka yesterday. The judge was unable to dismiss the whole claim but it is clear that while the actions of Donegal International were not strictly illegal, they were immoral. Zambia needs this money to meet the needs of its own people. Average life expectancy in Zambia is just 38. Average income per person is about 60p a day. Four out of ten women cannot read or write. Zambia desperately needs investment in healthcare, in education and in infrastructure. Its government is trying hard to use the proceeds of debt cancellation in this way, with notable success. The cancellation that Zambia secured in 2005 and 2006 was intended to ease its financial situation and release resources for social spending. Donegal should not be exploiting this situation by making Zambia pay millions of dollars, especially since it is in payment of a debt that cost relatively little. The company bought the debt at a highly reduced price in 1999, at a time when Zambia was considered poor and indebted enough to qualify for debt relief – and that it would be obliged to ask all creditors for this relief. Zambia had already been trying to negotiate a deal with Romania, which would have seen it paying only around $3 million – a vast reduction on the original $15 million owed, let alone the $55 million for which Donegal ultimately sued. Yet one month before Zambia was finally granted debt cancellation in April 2005 – intended to improve its economy and provide the necessary resources to meet its peoples’ needs – Donegal launched its lawsuit. Other creditors have, in good faith, cancelled debts that are in some cases much larger. Rich country creditors, including the UK, have agreed to cancel Zambia’s debt to them on the understanding that Zambia should then have extra funds available for poverty reduction, rather than extra funds to repay other creditors in full. For its part, Zambia has an obligation to negotiate comparable levels of debt relief with its other creditors, as it was doing with Romania when Donegal bought up the debt. If Donegal exacts even the reduced payment of around $15 million, Zambia will be forced to compromise these obligations to creditors and the spirit of cooperation and good will on which the existing debt cancellation framework depends. And a large sum of money will go to an offshore company, instead of helping finance Zambia’s poverty reduction efforts. I hope Oxfam and others will keep up this campaign. The Donegal case is immoral. Economic slowdown:Prediction: by Economist Allen Sinai in 2008, US gross domestic product(GDP)- the total value of all goods and services produced- is likely to increase between 1.5% and 1.75%. That will be a big slowdown from the third quarter of 2007, when GDP grew at annual rate of nearly 5%. The country will technically slip into a recession, which occurs only when the GDP shrinks, but for many people who earn less than they were before or lose their jobs, the slowdown in groth will feel like a recession. at the same time, rising prices will hurt consumers. For the year, expect the consumer price index to rise by nearly 4% compared with 3.5% increase for 12 months ending October 2007. Much of the increase will come from continuing rises in food, health care and energy costs. The latter already up 14.5%. The weak housing market will take a toll on consumers. In 2007, sales of existing houses dropped by 20.7% from one year earlier. US economy continue- according to the National Association of realtors, this decline will continue in 2008. With a glut of unsold homes on the market, already depressed home prices will fall further. With consumers cutting back on spending many companies will record weak sales. That will force reductions in hiring and capital spending. The unemployment rate will rise from the recent 4.7% to near 5,5% by the end of 2008. Layoffs will be particularly severe for home builders and retailers that sell housing- related products, such as furniture. The job picture also will be weak for automakers and companies hurt by rising energy prices. One bright spot: While the US economy will be soft, exports should remain strong. Companies that sells goods to china and other strong emerging markets will see revenues jump and continue hiring. faced with a weak economy, the Federal Reserve will try to stimulate borrowing by further lowering interest rates. The federal funds rate- a key short-term ratethat was at 5.25% until the fed began cutting last September- could drop to 3.5% or even lower by the end of 2008. Unfortunately for consumers, rates charged by banks for loans will drop nearly as much as other rates. With loans defaults rising, bank profitsare shrinking, so bankers are reluctant to cut loan interest rates. Also lenders will impose tougher credit standards, rejecting more borrowers. Lenders will be particulary reluctant to finance residential and commersial real estate purchases. Put only 45% of new investiments in stocks…35% in fixed income investiments and 20% in cash and its equivalent. FOR SAFETY, STICK WITH RELIABLE COMPANIES that can thrive in a slowing economy- large cap consumer like STAPLES. Other favorite choices include companies that make equipment for medical care, such as INTUITIVE SURGICALINC. BIO technology companies that are bringing out new drugs, in addition, high dividend- paying utility stocks to prove esilient. I THOUGHT OF SHARING THIS SINCE ZAMBIA IS IN DESPARET MODE FOR FOREIGN INVESTMENT. Be aware of sinking companies.You can tell how US dollar is depreciating. These are some of the reasons. Senator Barack Obama won the South Carolina primary in part because he was able to turn out large numbers of black voters. COLUMBIA, S.C. — Senator Barack Obama proved in South Carolina on Saturday that he could not only endure everything the Clinton campaign threw at him in the most confrontational week of the presidential contest so far but also draw votes across racial lines even in a Southern state. Candidate Topic PagesMore Politics NewsStill, his victory came in part because Mr. Obama was able to turn out large numbers of black voters, a dynamic that will not necessarily prove as decisive in the 22 states that hold nominating contests on Feb. 5. And his share of the white vote in South Carolina, 24 percent, was lower than what he drew in Iowa or New Hampshire, raising questions about whether race will divide Democrats even as the party shows tremendous enthusiasm for its candidates. If the South Carolina result buoyed the Obama team, it left Senator Hillary Rodham Clinton’s campaign facing a new set of questions. Her advisers’ steady attacks on Mr. Obama appeared to prove fruitless, if not counterproductive, and the attack-dog role of former President Bill Clinton seemed to have backfired. Surveys of voters leaving the polls showed that many Democrats who believed that Mr. Clinton’s role in the campaign was important ended up voting for Mr. Obama. In his victory speech Saturday night, Mr. Obama indeed sounded like a candidate with a cause, saying that the fight for South Carolina produced not only a personal victory but also progress over the divisive politics of the past. His target was clear enough without his naming names. Yet the race is about to shift in a big way, moving from the state-by-state battle it has been to competition on a national scale. Mr. Obama has some opportunities in Feb. 5 states, among them Georgia and Tennessee, to win over large swaths of black voters as he did in South Carolina. But like Mrs. Clinton, he will have to show appeal in a wide variety of states — some with liberal Democratic bases, including New York and California, and some more moderate, like Kansas; some with racially diverse populations, and some that are predominantly white. The third Democratic candidate, John Edwards, seemed like a fading force on Saturday night, although he won decisively among one group, white male voters. While he vowed to go on after four straight losses, a major question is whether voters who might have otherwise aligned with him might choose between Mrs. Clinton and Mr. Obama. Having failed to win even in South Carolina, where he was born and where he won in 2004 when he was running for president, Mr. Edwards faces the challenge of convincing voters that in going on he is doing more than just seeking influence within the party by amassing delegates that he can eventually throw behind one of his rivals. Mrs. Clinton may have won the last two nominating contests, in New Hampshire and Nevada, but she is now left to decide whether she needs to reassess her strategy. South Carolina voters showed little taste for the Clintons’ political approach. They said in exit polls that their main concern was the economy; during an all-out campaign blitz on behalf of his wife here, Mr. Clinton spent the last week highlighting Mr. Obama’s record on Iraq and his recent statements about the transformational nature of Ronald Reagan’s presidency. Mrs. Clinton’s advisers were minimizing the importance of South Carolina even before polls closed, saying the primaries in Florida on Tuesday and in the swath of states on Feb. 5 were more important. But she will have to reckon with the rejection of her candidacy by black voters and the mixed support she received from white Democrats and younger voters here — two groups that she must have by her side in order to build a cross-section of support in the coming contests. “The Clintons will now have to deal with a perception of hollowness about her strategy, that she is leaving it to her husband to take care of things and allowing him to overshadow her political message,” said Blease Graham, a professor of political science at the University of South Carolina. Tellingly, Mr. Obama and Mrs. Clinton left South Carolina on Saturday night for two states that, like this one, have moderate political constituencies that do not often embrace Democrats in presidential general elections. Mrs. Clinton flew to Tennessee to hold a rally with black voters in Nashville, while Mr. Obama was headed to Georgia. If South Carolina is any guide, the sizable numbers of black voters in Alabama, Georgia, and Tennessee could help Mr. Obama in the Feb. 5 primaries. And his victory Saturday may stir fresh excitement among voters there and in his home state, Illinois, as well as in other places where he is building support, like California and even Mrs. Clinton’s political base in New York. He also has bragging rights about a new coalition of support. About as many South Carolina white men voted for Mr. Obama as for Mrs. Clinton, and about 70 percent of white voters said they would be satisfied if Mr. Obama won the Democratic nomination, according to exit polls was conducted by Edison/Mitofsky for the National Election Pool of television networks and the Associated Press. More than half of black voters in the state said the country was definitely ready for a black president, while only about a quarter of white voters reached the same conclusion. By contrast, about one-third of both South Carolina whites and blacks said the country is definitely ready for a women president, the exit polls showed. Zambia Needs Change continues….. What it takes to be a democratic country.What lessons can we learn from this…. In a bitter campaign here infused with discussions of race, Mr. Obama’s convincing victory puts him on equal footing with Mrs. Clinton — with two wins each in early-voting states — and gives him fresh momentum as the contest plunges into a nationwide battle over the next 10 days. Former Senator John Edwards, a native of South Carolina who was trying to revive his candidacy, came in third place but vowed to keep his campaign alive, despite failing to win a single state so far. With 99 percent of the electoral precincts reporting, Mr. Obama had 55 percent of the vote, Mrs. Clinton had 27 percent, and Mr. Edwards had 18 percent. The candidates are now taking their campaigns to states like California and New York for contests that hold vast numbers of delegates and will test their already strained budgets. But Mrs. Clinton’s statement suggests that her hopes also rest partly on Florida, which holds its primary Tuesday. The state has been stripped of its delegates because the vote is being held earlier than party rules allow, and the Democrats are not campaigning there. Mr. Edwards’s third-place finish raised new questions about the future of his candidacy. While he says he is intent on carrying on, he campaigned heavily in South Carolina and won this state in 2004. His failure to draw more support here raises questions about his long-term ability to capture votes among those thought to be his base. 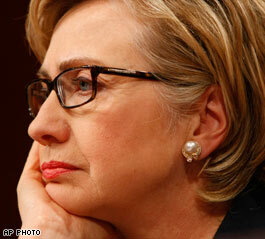 But he could play the role of delegate-collecting spoiler in the fight between Mr. Obama and Mrs. Clinton. South Carolina was selected by Democratic leaders to hold one of the opening contests in the nominating season to add racial and geographic diversity to the traditional opening states of Iowa and New Hampshire. With 45 delegates to the Democratic National Convention, split by Congressional district, it is the biggest prize so far. The South Carolina Democratic Party estimated that Mr. Obama would get 25 delegates, Mrs. Clinton would get 12, and Mr. Edwards would get 8. The voting took place at the conclusion of a weeklong campaign, where issues were interwoven with discussions of race. A poignant reminder of South Carolina’s historic racial divide, the Confederate flag, swayed in the cool breeze on Saturday only a few yards from where supporters waved placards for Mr. Obama, who if elected would become the nation’s first black president. Zambians what are learning from this.We need your comments. Who are the future persidents of Zambia? Remember your own saying of” Imiti ikula e mpanga” Where are all growing trees? Belliah’s advice: At all cost Zambians should not endup like this….We are smart people. 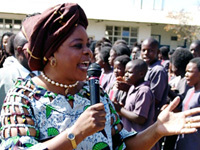 Zambians, there are more serious issues that you should worry about, than wasting all your energy and anger on Mrs Mwanawasa. The comments in the times of zambia sunday newspaper published on home page ,left me with the mouth open.It shows what level of education you all have. That is why there is a ballot box. 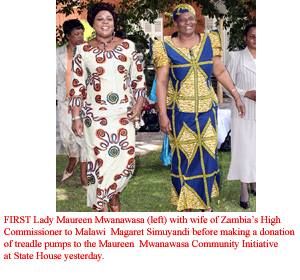 Dont you think below is more serious than Mrs Mwanawasa. Zambia Medical Association (ZMA) president Dr Swebby Macha is disappointed by the pharmacy regulatory authority’s failure to properly examine the withdrawn injectable contraceptive, Depo Provera when it was imported. Dr Macha was commenting on government’s decision to withdraw Depo Provera from health institutions after the drug tested HIV positive for antibody tests. But the United States government has insisted that Depo Provera is safe. Unites States embassy public affairs officer Christopher Wurst said yesterday the drug was designed to be tested with human blood, but was wrongly tested with something else which led to adverse results. “The U.S. Embassy is concerned that rumours surrounding the contraceptive drug Depo-Provera have given Zambian citizens mistaken impressions. Depo-Provera is safe, and like all drugs distributed by the U.S. government, it must meet the standards of the U.S. Food and Drug Administration (FDA),” he said. “Imagine trying to have a pregnancy test using tap water. You may get positive results, but they certainly wouldn’t be accurate or valid. However, Dr Macha said government’s decision to withdraw Depo Provera due to its harmful nature was an unfortunate development that could have been intercepted upon importation of the drug. He said it was regrettable that the harmful nature of the drug had been detected when people were already using it. He said government should immediately withdraw the drug from the health institutions where t hey were administering it to unsuspecting mothers. Dr Macha said after the Depo Provera has been completely withdrawn, it needed to be shelved for a longer period as government was conducting tests to ascertain the extent of its harmfulness. “We want to get to the bottom of the issue and find out from the Ministry of Health and pharmacy regulatory authority how they allowed this drug into the country,” Dr Macha said. “We need to find out how many people are on this drug and those who have taken it must come forward for further tests. If some of them have contracted HIV in the process of taking the drug, they can even claim for compensation. Initially suspicions were raised when some batches of the drug were labeled ‘not for internal use’. Dr Macha said the Ministry of Health should beef up the pharmacy regulatory authority in order for them to conduct the work properly. Health minister Dr Brian Chituwo on Saturday confirmed that two antibody tests on the injectable Depo Provera have tested positive for HIV. Dr Chituwo said Depo Provera has been completely withdrawn and quarantined pending completion of scientific investigations. He said the public would be kept informed on the continued investigations of Depo Provera. He said Depo Provera was donated by United States of America government through the United States Agency for International Development (USAID) and that Zambia started receiving batches of the liquid injectable contraceptive in November last year. Dr Chituwo said Lusaka alone got a consignment of 10,000. Pharmacia and Upjohn of the United States of America manufacture Depo Provera. NEW YORK, September 8, 2004 (LifeSiteNews.com) – With its insistence on the use of injected contraceptives, health organizations pushing Depo Provera have been spreading AIDS and other sexually transmitted diseases in the developing world. A new study by the National Institutes of Health, University of North Carolina and Johns Hopkins University in Baltimore have found that the use of injected hormonal contraceptives increases the risk of STD’s. Charles Morrison of Family Health International in Research Triangle Park, N.C., who led the study, said that it is possible that the drug itself actually increases susceptibility to disease. The study says that the use of such drugs can increase the risk of STD’s as much as three-fold. The Population Research Institute in their Weekly Briefing mailout, said this is not news to people lobbying against the widespread use of artificial contraceptives in the developing world. They point to a 1996 study that found an elevated HIV infection rate among monkeys who were given subdermal progesterone implants. They warn that the so-called ‘family planning’ programmes pushed in the third world by organizations such as the World Health Organization and UNFPA, are in fact engaged in spreading sexually transmitted diseases including the deadly AIDS virus. From 1994-2000, USAID provided 41,967,200 units of Depo Provera into the developing world, at a cost of over US $40 million. Even the Reuters newswire story included a sober note on the implications for foreign depopulation programmes in Africa. Pro-life lobbyists and countries with strong pro-life ethics have long complained of the coercive nature of UN-distributed foreign aid, saying that it is invariably linked to the use of contraceptives and abortion. The new research suggests that the strategy of using contraceptives to reduce the rate of STD’s has backfired. In the nineties, when it was receiving funding from the Clinton administration, the UNFPA was shipping 20 million doses of Depo Provera a year. Depo Provera is a major component of foreign-funded family planning programs in Africa. USAID sends more units of Depo Provera to Africa, to countries such as Mozambique, Tanzania and Nigeria, than to any other part of the world. PRI’s President, Steven Mosher said, “As the HIV/AIDS epidemic in Africa rages out of control, we have been recklessly promoting and distributing drugs which make women even more vulnerable to the deadly virus. We have been pouring gasoline on a fire.” It remains to be seen what response will be made by the population control agencies at the UN to this new information. United States of Africa being advocated by some African leaders has not come. but that the time has not come for such a government on the African continent. 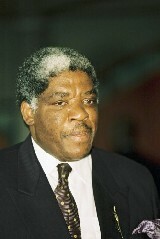 Dr. Mwanawasa said there is need to strenghthen regional community organisations like SADC before thinking of the United States of Africa concept, which is a version of the possible future unification of Africa as a national and sovereign federal of states similar to that of the United States of America. “When these organisations have been strengthened and our people sensitised and willingly accept the concept and only when we feel we are ready can we have that idea, but for now we are afraid we are not going to accept it.” he emphasised. Dr. Mwanawasa said this in Antananarivo when he held a joint press briefing with his Madagascar counter part President Marc Ravalomanana today. The idea of the United States Africa concept was recently advanced by Libyan President Muammar al-Qaddafi at a 2000 AU summit in Lome, Togo and in June 2007. It was further advanced by outgoing Africa Union Commisson chairperson Alpha Oumar Konare on the occassion of the commemoration of the Africa Day in May 2006.
an idea they will need to seek views from the people in Zambia or Madagascar. ” Let us not be rational, there is no need to confuse the people on something that needs serious consideration and consultation. We are doing everything possible to protect the interests of Africa and our individual countries,” said President Mwanawasa. countries in Africa would produce a President for the United States of Africa concept. 15 ministers outlined in the concept,” he said. Dr. Mwanawasa noted that the issue of United States of Africa has received a lot of public debate, positive and negative. President Levy Mwanawasa has said Zambians who do not look after public resources properly did not deserve to be entrusted with carrying out public jobs. Speaking to journalists at the Lusaka International Airport today shortly on arrival from Madagascar, President Mwanawasa said it was sad that people that were suppose to take care of Zambia’s public resources and use them diligently were engaging into corrupt and crooked activities. He said the report, which was submitted to him by the Auditor General on Tomorrow Investments was very bad, adding that he has since instructed his Legal Assistant Darlington Mwape to deal with the case carefully. “If that is how some of our nationals are going to look after our national resources, then they do not deserve to be given public jobs,” he said. He was answering a question from journalists on his comments about the Auditor General’s report on Tomorrow Investments that was submitted to him recently. “But I have asked my Assistant for Legal affairs to separate the case and identify the counts. It is not only Tomorrow Investments but various other contractors. These will be handed over to the Anti-Corruption Commission (ACC),” he said. Dr. Mwanawasa hoped that the case would commence soon in court. He said it was sad that lack of integrity could be exhibited by officers who should help government to look after national resources prudently. And Dr. Mwanawasa has asked mining companies criticizing government for increasing the tax regimes on mines to dialogue with government instead of complaining publicly. He said it was only fair that government should raise tax on mines so that Zambians could benefit from their resources. The President noted that despite the increase in the mine tax regime, Zambia still had the lowest in the world. President Mwanawasa also cautioned Zambians against being used by investors to oppose the new tax regime on mines. PATRIOTIC Front president Michael Sata has advised his supporters to avoid violent campaigns in the Kanyama Parliamentary by-election. Mr Sata said yesterday that PF supporters should not join in violent acts during campaigns. “The way they are throwing stones is the way violence started in Rwanda. That is how the violence in Kenya started,” he said. Mr Sata was addressing a public rally at Linda football ground to drum up support for the PF candidate Colonel Gerry Chanda. He called on voters not to sell their voters cards but use them in this Thursday by-election. Mr Sata said PF was the only political party which spoke for the poor people. He alleged that Government established the National Constitutional Conference (NCC) to “shut up” the opposition. The PF leader warned Col Chanda that he risked being expelled from the PF if he joined the NCC after being elected as Kanyama MP. Mr Sata advised Col Chanda to work towards addressing the plight of vulnerable people in the constituency. He said crime levels were on the increase in Zambia because there were no jobs for young people. Mr Sata alleged that the Government had lost more money through thefts and misapplication of public funds under President Mwanawasa’s tenure of office. He urged the electorate to accept “bribes” from political parties but vote for the PF candidate. THE Electoral Commission of Zambia (ECZ) yesterday extended voting time in polling stations, which opened late to allow voters cast their ballots in the Kanyama constituency parliamentary by-election. And election officials at polling centres described the turnout as fair but said it could have been much better if there had been no rain in the morning. ECZ spokesperson, Cris Akufuna, said ECZ had decided to extend the voting because some polling stations had opened late because of the rain that hit Lusaka yesterday morning. He cited Mutandabantu Centre which had about three polling stations where tents had been blown off and officials had to re-erect them. Mr Akufuna said that voting at polling centres which had started late would go on to about 21:00 hours. However, some voters braved early morning rain to cast their votes to choose one of the seven candidates vying for the seat. Some residents went to cast their votes as soon the polling stations were opened at 06:00 hours despite the heavy downpour. Times random check showed that at Mwapona A, 200 people out of the registered 2,600 had cast their votes by 12:00 hours. At Mwapona B polling station which has 3,550 registered voters, 250 had cast their votes at 12:00 hours. Mwapona A polling station presiding officer, Liabela Lubasi, described the voting pattern as very good, especially after it had stopped raining. Mr Lubasi said more people were expected to vote in the afternoon. At Kalumba polling station, 200 people had voted by 13:00 hours. The polling station has over 1,500 voters. Presiding officer, Anne Kamana, said the turnout was encouraging looking at the number of people who had cast their votes at that time. “People were coming to vote even at the time it was raining, which is encouraging,” she said. And a monitor from Zambia Peace Foundation (ZPF), Samuel Kabumbwe, said the voting at the polling station was peaceful. A check at Yeta polling station at 13:10 hours revealed that 243 had voted out of the registered 2,195 voters. Another check at Emmanuel Mulemena polling station showed that 225 out of 2,173 registered voters had cast their votes at 13:10 hours. At Bwelani polling station, which has 2,325 registered voters, 170 had voted by 13:30 hours. A check at Munkolo polling station in Linda township showed that people were still voting at 17:30 hours, and that a total of 500 people had cast their votes out of the 3,000 registered voters. Presiding officer, Mwape Mukosha, said they would ensure that all the people who arrived at the polling station by 18:00 hours were given a chance to cast their votes. “We will make sure we capture all those who are already here,” he said. The MMD fielded Mwalimu Simfukwe, United Party for National Development (UPND) fielded Harrison Mukupa, United Liberal Party (ULP) was fielding Elizabeth Phiri and Patriotic Front (PF) had Gerry Chanda. Other parties contesting the seat are UNIP’s Husty Mwachilele, FDD’s David Kasanga, and All People’s Congress (APC) leader Kenny Ngondo. By Press time counting had started and results were expected late in the night. HAVANA — Raúl Castro, who has labored in the shadow of his brother Fidel since the days of the Cuban revolution, became the new president of the Communist island on Sunday, ending his brother’s 49-year rule and washing away hopes here that a younger generation might take power. Times Topics: Raúl Castro | Fidel Castro | CubaIn his first words as president, Mr. Castro made it clear that he would make no radical changes and promised to consult his brother on every important decision. He said his brother was still alive and alert, and the time had yet to come when the leaders of the revolution in the 1950s had to pass the baton to a new generation. Yet the moment marked a turning point in Cuban history. For the first time since Fidel Castro seized power in January 1959, the government is in the hands of a different leader, a pragmatic military officer who lacks the charisma and ego of Fidel Castro. Raúl Castro has a reputation as a consensus builder, a man who listens closely to his advisers, delegates authority and holds his underlings accountable for their decisions. The trappings of Cuban leadership had also changed, even if the message did not. Fidel, ever the revolutionary, usually appeared in olive green fatigues; Raúl, 76, addressed the assembly in a dark grey suit, a steel-colored tie and gold-rimmed glasses. Raúl spoke calmly for half an hour, a sharp contrast with his brother’s fiery lectures that frequently rambled on for hours.Raúl Castro also said the government needed to change to survive in the new era. He proposed putting more power in the hands of provincial governments and streamlining the bureaucracy in Havana. “Today a more compact structure is required,” he said. He made it clear no government institution was sacred. “We should never believe that what we have done is perfect,” he said. Despite these hints of change, other actions by the assembly ensured the continued power of Cuba’s old guard. It not only chose as president Raúl Castro, but it also picked another veteran of the revolution, José Ramón Machado Ventura, 76, as the first vice president. A former health minister, Mr. Machado Ventura has a reputation as a Communist hard-liner fiercely loyal to the Castros. And the assembly re-elected Ricardo Alarcón, 70, as its president. The decisions appeared to dash the hopes of Fidel Castro’s younger followers. Some had expected a younger politician would take over the helm of the legislature, an important bully pulpit even if the body itself only rubber-stamps the president’s decisions. Carlos Lage, a 56-year-old physician close to the elder Castro who engineered the economy after Soviet aid dried up in the 1990s, remains in the same role he had before, one of five vice presidents. The foreign minister, Felipe Pérez Roque, 42, was also passed over for promotion. President Hugo Chávez of Venezuela, Cuba’s main foreign benefactor, Hugo Chávez of Venezuela, called Raúl Castro on Sunday to congratulate him and invite him to Venezuela. Perhaps the most important challenge facing the new president is the struggling economy. Since becoming acting president in July 2006, when his brother became ill, Raúl Castro has raised expectations among Cubans that he might make it easier to earn a decent salary within the state-run system. In his speech, he said he would to lift some of the regulations that strangle private enterprise and that he would gradually revalue the Cuban peso, now nearly worthless, to allow people on miserly state salaries to earn a better living. “The country has a priority to satisfy the basic needs of the population, both physical and spiritual,” he said. But many Cubans greeted the news with a shrug, doubtful that after years of brutal economic conditions, Raúl Castro would improve their lives anytime soon. Although they had no alternatives, several delegates said they were satisfied with the selection of Raúl Castro as their next president. The National Assembly was elected last month in elections completely controlled by the Communist party, the only political organization permitted on this island of 11 million people. Fidel Castro, 81, was said to be too ill to attend the meeting, and he voted through a proxy. When his name was called in the roll of delegates, the assembly gave him a 30-second standing ovation. In a sense, who holds the office of president hardly matters, experts on Cuban politics say. Fidel Castro remains the head of the Communist party, by law the ultimate authority in the land. Raúl Castro, the former defense minister, still has the loyalty of the military. Since the collapse of the Soviet Union, the military has become much more than simply an expeditionary army at the service of what was once the Soviet bloc. Cuba’s active and retired military leaders, who served under Raúl Castro for decades, oversee important state-run businesses, from agricultural production to tourist enterprises, the all-important earners of hard currency. They are likely to play a critical role in consolidating Mr. Castro’s power over the new government, and they are the only figures in Cuban society who have the power to bring down the government quickly. Most have close personal relationships with Mr. Castro, who has put them in lucrative positions of authority and power. “Raúl controls everything, every important position in the country,” said Vladimir Roca, a former fighter pilot who broke with the government and served prison time for speaking out against the Castros. The Republican Party has me absolutely paralyzed with confusion. Perhaps being a lifelong Democrat I am just simply not supposed to understand. Being a supporter if Senator Obama I will not cheapen his accedemic accomplishments by making comparisons to those of our current President or his probable future opponnent, Senator John McCain. That would simply be unfair. This all came to mind for me as I recently watched a TV biography of Mr. McCain’s life. The college years I found more than slightly humorous, but also strikingly similar to the college story of George W. Bush. Seemingly both men were accedemically, well… challenged. Amid the news clips of preachers, passports and prostitutes this week, there was also Senator McCain stumbling through diplomatic misstatements with repeated and consistent ineptitude. There are those who are suggesting that this was contrived. I almost bit on that, until his “Halloween” comment in Israel. That was the clincher! So as we approach the stretch in the run for the White House, the pride of the Republican Party is providing a telling glimpse ahead. Again, I don’t claim to get it, but let me attempt to explain what has me scratching my head. What I see is the Republican party polishing their strategy and preparing for what they hope will be a hard fought contest in November. This, while Senator McCain repeatedly makes an international fool of himself. With an opportunity to look “Presidential” on the world stage, he is singularly cultivating the image of a nervous unprepared student who is unexpectedly called upon to answer a question in class. Then there is poor Joe Lieberman, playing the part of “Monkey In The Middle”. He is like the symathetic friend who finally whispers the correct answer, unable to see his friend suffer in embarassed confusion any longer. Most of the time Senator McCain looks like he could use a nap. Campaigning at this level must certainly be absolutely grueling, and the final contest has yet to begin. At this rate, come November, they will probably have take his straight jacket off just before they drag him out in front of a microphone to utter a few slobbering syllables. I don’t have anything against Senator McCain, and given he is an old sailor like me, I can stomach him better than most (dare I say “typical”) Republicans. I’m actually starting to feel some measure of sympathy for the man. As in truth, I predict that he will ultimately face Senator Obama, and that he will lose by the greatest margin in history. Remember you heard it here first. Truthfully however, I am genuinely haunted by the following core questions. How does the primary process let this happen? Is this a smoke screen of sorts or is this really the best that the Republicans have to offer? Has the Republican Party become a cheap seedy Oriental Resturant where the only entrée on the menu is “somedumbguy”? Is there a secret Republican Party “Affirmative Action Program” ongoing that provides for letting the stupidest politician among them represent their party from time to time? If it were not for the primary elections process I would be envisioning the Republican Party leadership with their ties loosened, drunk out of their skulls in some hotel suite. Then, someone in their group piping up and saying: “let’s give it to McCain” and they all roar in uncontrollable laughter. Then someone says: “Remember Bush?” and the all drop to their knees and roll on the floor in breathless hysterics. Perhaps it possible that the power brokers are intentionally financing and positioning their candidates on the basis of control and future influence? Is it possible that such intellectually and cognitively challenged persons are more easily controlled and manipulated by the Republican Party and its power brokers should they reach the White House? Can it really be that simplistic? I don’t get it and I am convinced that I am not supposed to. But am I the only person who is seeing this? Is this just simply my illusion? Or is it Republican “evil genius”? I believe we are currently witnessing an exquisite political strategy being executed by the Democratic Party Leadership. This, in the form of an orchestrated trickle of Super Delegates publicly indicating support for Senator Barack Obama. The recent endorsements in favor of Senator Obama by Bill Richardson and Bob Casey are among the first key indicators. Additionally, that trickle I have suggested may well develop into a stunning trend even before the important primary contest in Pennsylvania. If I am right, not only will this influence the Pennsylvania voting, it will send a clear message of doom to Senator Clinton. Clearly there is no direct or clear path for either candidate to gain the required number of delegates prior to the Democratic National Convention. This alone, without considering any of the many further impacts is simple grounds for the contest to continue. However there is an obvious and growing advantage in favor of Senator Obama in terms of sheer numbers. This is the basis for the many discussions and comments about the necessity for Senator Clinton to concede and withdraw. Under the current rules she simply can not expect to catch up. Basically, the voters have already spoken. She may say what she likes but a decision (Clinton Nomination) at the convention is nothing more than a pipe dream. Perhaps more importantly, the Democratic Party Leadership has got to begin consolidating their campaign efforts behind a single candidate in an effort to keep pace with the efforts of the McCain Campaign on the Republican side. Further, the Clinton machine is seemingly most comfortable playing in a dirty sandbox and unphased by any damage their tactics my do to the party as a whole or to Senator Obama should he receive the nomination. One of the interesting aspects of the Clinton campaign strategy is their inability to assess the uniquely new and seemingly different political climate in America. It is clear that Senator Clinton has a well know reputation of being polarizing within some groups. What she seemingly does not realize is that her caustic characteristics are now damaging her credibility within her own political party as well as across the nation. I am convinced that the bulk of the Democratic Party Leadership have already made their choice in Senator Obama. They must now delicately implement their strategy and show their support individually yet in a way that does not overtly appear to be damaging to the party or to their relationship with the powerful Clintons. Of course there will be continued dismissals and insults from the Clintons initially, but eventually and I believe very soon they will find themselves at a greater and disadvantage that signals to them sure defeat. The media and political junkies would love to see this contest continue but it has reached a point of diminishing returns for the Democrats. In order to quell the threats of party defections in November and in an effort to get the Obama Presidential Campaign moving as quickly as possible the Democratic Party Leadership has got to abandon the Clintons. I must say that the concept of party defections is definitely being over blown by the media. It is a long way to November. The media is suggesting that there is no leadership figure in the Democratic Party capable of resolving this matter. I think that they are wrong. We may never know who devised this strategy but I feel confident that is real and that we will soon see the proof if it. I fear for Zambian politics,it seems we are heading back to stone age UNIPIST politics when KK would fire ministers on public media in a rahter undignified manner and refer to journalists as stupid idoits. God help Zambia and serve us from the reign of Rupiah Bwezani Banda. We as Zambians are fully responsible for creating buffons and put them in high office!what political career has Rupiah banda?he was governor of Lusaka during KK’s reign,did you not notice that he spent his entire time kneeling before KK?What improvements did he bring to the capital?if you recall,we had high levels of dirt in the city,basic water supplies where disrupted,now i wsh to ask my fellow folks,if you see his record at a local level,enhance that to a national level and come up with an answer,what the … do you think this man will achieve?simply answer NADA,he’s trying to draw attention to the fact that he is failing to deliver the goods his predecessor had started,he will not fill Levy’s shoes,they are too big and will always be shining,so Zambians as we start ruminating about what is to befall us,let us look at ourselves and find out what we want,these guys in power are after one thing lining their pockets!!!!!!!!!PERIOD. It was interesting to read…you have some great information on your blog. Your insight and expertise would be a welcome addition to our new community, i hope you will consider joining 🙂 and thanks for sharing!